Buxton joint-boss Steve Halford believes two upcoming away trips will both be six pointers even at this early stage of the season. The Bucks are fifth in the league going into the visit to ninth-placed Farsley Celtic on Saturday and then current leaders Scarborough Athletic on Tuesday night. And Halford is keen to see points against those around his side in the table picked up whenever possible as Buxton aim to gain advantages where possible in the promotion race. He said: “It’s pointless looking too much at the table yet because it’s so tight and probably needs another ten games or so to really be an accurate depiction of where we’re all at. “That said, games against those who are also up in the top parts of the league are always six pointers because if we lost out then that gives the opposition key momentum and it’s the other way round if we can win them. “So these two games will both be very tough but if we want to have anything like a promotion push then we need to win them as we aim to put a good run together once again. After a free weekend, Buxton hosted Grantham Town on Tuesday night and ran out 1-0 winners thanks to Ashley Young’s deflected first-half strike. The struggling visitors battled well as they searched for a point in the second-half but Buxton held on to take the three points for their second win on the bounce. Halford said: “We were hampered by missing Liam Hardy due to illness and then Jude Oyibo got injured in the warm-up so couldn’t play a part. 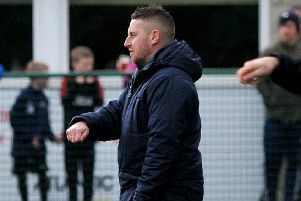 “We’ve then lost Tom Dean at half-time with an injury too, but the way we’ve built our squad means that if we do have injuries then we have good quality replacements to bring in. “Grantham deserve credit for coming back at us in the second-half but they didn’t take their chances whereas we took ours, albeit we probably should have scored more than just the one. “It’s also pleasing that we got another clean sheet as that’s six from 11 games this season, which is already double what the team achieved last season. There was a debut on Tuesday for new striker Tolani Omotola, brought in from Coalville Town last week, with Halford adding: “He hadn’t played for a couple of weeks which showed at times, but he put a good shift in and although he should probably have scored a couple of goals he was at least in the positions to get the chances.